The end of the year has snuck upon us. After two months of no-Christmas-it’s-barely-Halloween, it’s actually time to buy a tree. I saw the bin with our decorations in the garage, but didn’t have the courage to try and dig it out from under all of the other boxes. I did, however, offer to host a small brunch without considering the implications…implications being that I have to clean up the paint trays and half-empty boxes…and figure out what to do with the cabinet still lying in the living room. Maybe I’ll throw a sheet over it and pretend it’s decorative? In any case. Squash! 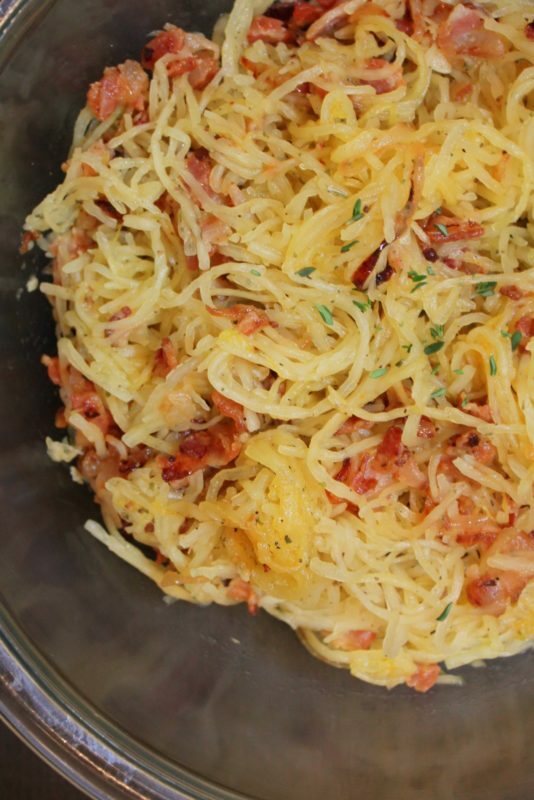 This is a lovely simple recipe: bake squash, cook bacon, cook onions, mix together. Top with cheese. 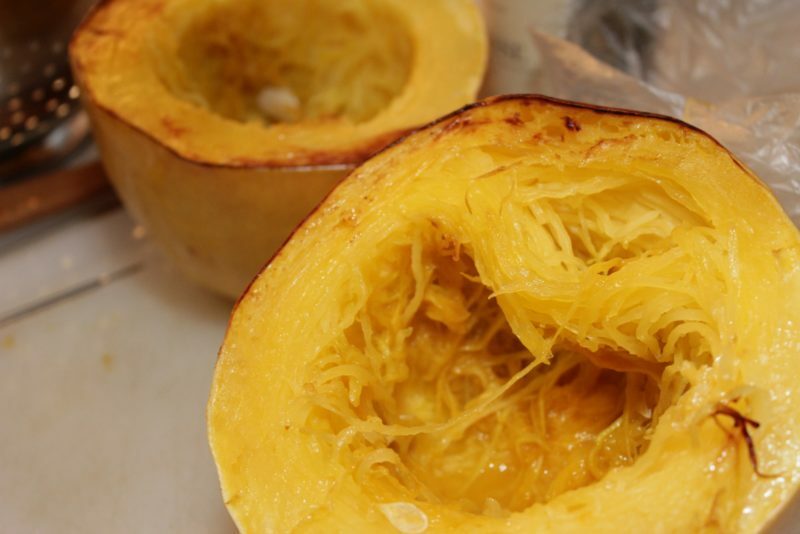 And I learned something new: spaghetti squash strands run not down the length of the squash, but around the circumference. So if you like the strands longer, cut the squash into two short halves. Say yes to the squash! Preheat oven to 375 degrees. Cover a baking sheet with foil. Halve spaghetti squash around the "equator," forming 2 short halves. (This helps keep the long strands intact.) Scrape out the seeds. Coat the cut ends with a little olive oil and place those on the baking sheet. Bake until tender, 35 - 45 minutes. While the squash is cooking, saute bacon over medium heat to desired level of crispy. Remove and drain on paper towels. Drain most of the grease, leaving a couple of tablespoons. Turn heat down to medium low. Add onions, garlic, and oregano. Saute, stirring occasionally, until soft and beginning to brown, about 10 minutes. When squash is done, allow to cool for 10 minutes. Using a fork, scrape the strands out into a bowl. 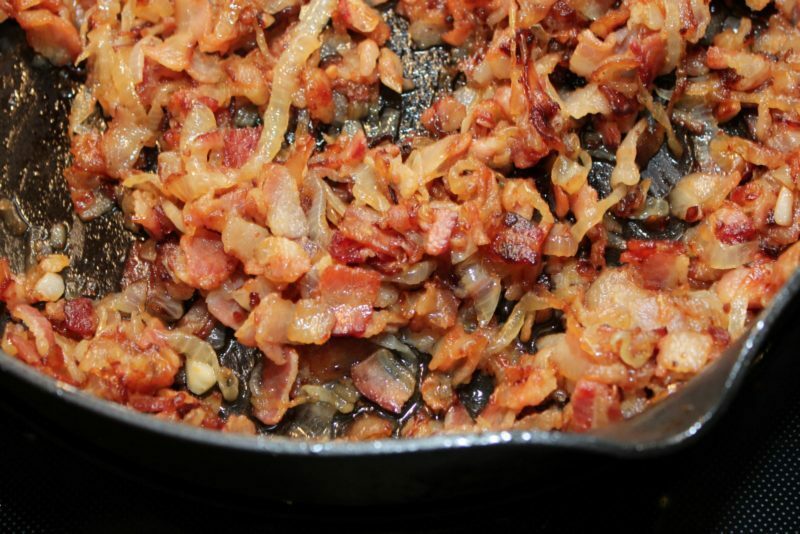 Toss with onions and bacon; season with salt and pepper to taste.